Whether it’s writer’s block or being camera shy or not having the ‘right tools’ to produce quality content, the barriers can seem overwhelming. It doesn’t have to be as difficult as you’re thinking it is. Read on friend! Before you get started with the production first take a moment to rough out an outline of what you actually want to say. At some point in your key points you’ll want to include a call to action; some step that you are going to want your audience to take. It could be simply, ‘call to learn more’ or ‘click to download this report’. You may find that you’re not the best writer, or that you get nervous behind a microphone, or you feel awkward in front of a camera. If you want to create content that resonates with people it’s important that it’s authentic. Consider hiring a freelancer or pulling in another member of your team to deliver the message. There's likely hidden talent from within your team; perhaps that employee who is singing in the halls or the person who seems to be a magnet to other people in the company. Chances are, they are shining stars with the charisma and company knowledge to be a fantastic ambassador. 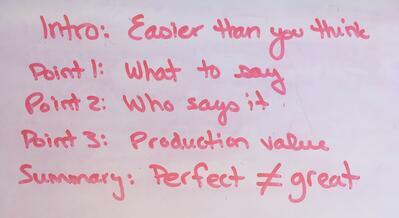 Before you hit record, or write that next award winning article, take a quick pause to think about production value. Every bit of content you publish, no matter what platform or medium you use, says something about your company. It tells a brand story. Making sure that the level of production matches the story you want to tell is a critical piece. This is everything from the quality of audio (think microphones and recording studio) to your camera setup (ranging from Blair Witch Project to professional studio). Even think about your writing style and presence of branding in what you’re creating. These are all subtle pieces that together tell a big story about the type of company you are. Perfectionism always gets in the way. French philosopher and writer Voltiare once penned, “Perfect is the enemy of good”. Start creating. As you learn what works for you and your company you will have the opportunity to tweak and get better as you go. I've long used the saying "write fast, edit slow". The more content you create, the more seamless the process will be. At first you’re going to find that there are multiple takes and edits and maybe even a few false starts. As time goes on, you will establish the processes and systems to be able to knock out the content that you enjoy creating and your customers value.